President Duterte was on global news again yesterday, wow. And again, for the wrong reason. UNexit. What a parochial, onion-skinned mind. "I do not want to insult you. But maybe we'll just have to decide to separate from the United Nations," he said. "If you are that rude, we might just as well leave," he said. "So take us out of your organisation. You have done nothing. Where were you here the last time? Never. Except to criticise," he said. 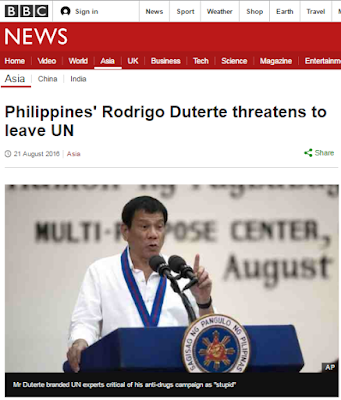 Mr Duterte said the UN should refund its contribution "so we can go out". Mr Duterte said the UN had been unable to combat hunger and terrorism and had failed to end the killing of civilians in Iraq and Syria. I am no fan of the UN in its climate alarmism drama and racket. But in enforcing international rule of law regarding territorial disputes, settling big differences between or among countries in a peaceful manner, I support the UN. Our membership there is useful and important for us. I can understand the torment that PH diplomats suffer out there abroad. Pgong's mind and mouth is so unstable and unpredictable. Ang bilis mapikon eh, parang bata batuta. Tough job defending or sanitizing his statements. "You now, United Nations, if you can say one bad thing about me, I can give 10 [about you]. I tell you, you are [useless]. 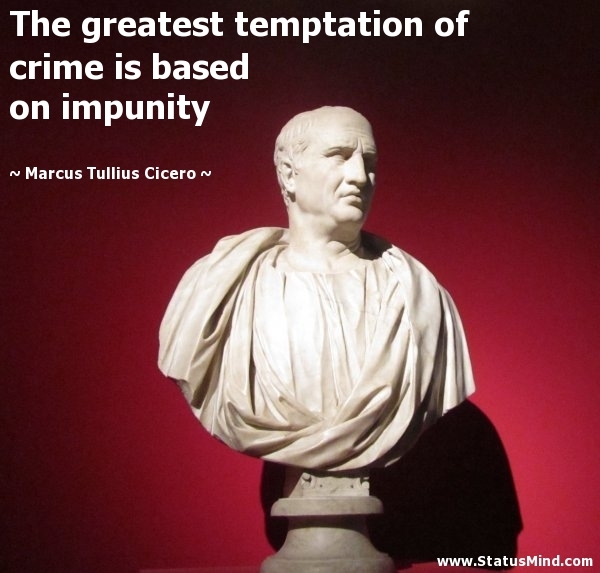 Because if you are really true to your mandate, you could have stopped all these wars and killings." Somehow Pgong is correct here. The UN is busy with so many non-core functions like climate alarmism and "save the planet", and endless welfarism like MDGs, SDGs. Its core function, its raison d'etre why it was formed after WW2, has been heavily diluted. So that it has little resources left for settling territorial and cultural/ethnic disputes between or among countries. We have to thank the UN through its Permanent Court of Arbitration (PCA). The PH governent panel won over China, we got lots of foreign support and diplomatic sympathy vs. China there. * This is my article in BusinessWorld last August 17, 2016. Brownouts, actual and potential, have returned to some areas of Metro Manila and surrounding provinces in the Luzon grid over the past two weeks. This is unfortunate because electricity demand has somehow declined because of the colder, rainy season and more power plants have been added to the grid. This rare event was caused by heavy stress in the Luzon grid as a result of the unscheduled outage of several coal-fired, hydroelectric, oil, and geothermal power plants in the grid, many of them are already ageing. Among these coal plants were (a) 382 M-W Pagbilao’s unit 2 (U2), (b) 122 M-W South Luzon Thermal’s U1, (c) 140 M-W Southwest Luzon’s U2, and (d) 60 M-W Limay Cogen Block 5. Among the hydro plants were (a) 50 M-W Angat Main U4 and (b) 180 M-W Kalayaan U1. Then 83 M-W from Makban Geothermal and 280 M-W from Malaya Thermal U1. Almost 1,300 MW of power went on unscheduled or unplanned outage, plus power plants on scheduled or planned maintenance shutdown. The newly-commissioned wind and solar plants in Luzon cannot and will not be able to fill up the power deficit. If the wind DoEs not blow, wind power is zero; if it is night time or day time but very cloudy, then solar power output is zero or very low. This situation again highlights the need to continue building new coal and natural gas plants. The proposal and lobbying by certain sectors and environmentalist groups to discontinue building new coal plants and build only intermittent renewable energy (RE) plants like solar and wind is not wise. The Philippines’ fossil fuel consumption remains among the lowest in Asia’s emerging and developed economies plus Australia. “Reliability breaches” is a technical term for power outages or blackouts. And AEMO projects that it will take place in three to four years from now. Replacing coal power with additional RE capacity will not compensate for the loss of coal capacity. AEMO was candid enough to categorically warn about the dangers of cutting coal power and pushing more renewables into the system. This candor is good because it will prepare both power suppliers and consumers of what’s going to happen few years on the road. One explanation for such candor by AEMO is its independence from the government as the latter pushes for more REs. In contrast, the Philippine Electricity Market Corporation (PEMC), AEMO’s counterpart here as electricity market operator, is government-dependent. It is headed and chaired by the DoE (Department of Energy) secretary and many board members are from the government, like the National Power Corp. (NPC), National Transmission Corp. (TransCo), and the Power Sector Assets and Liabilities Management Corp. (PSALM). Since the DoE is the main implementer of RE Act of 2008 (RA 9513), DoE is naturally pushing for more intermittent REs into the system and that is what PEMC is exactly doing. The latter for instance produced a study in November 2015 saying that REs that are priority dispatch at the Wholesale Electricity Spot Market (WESM) have created the “merit order effect” (MOE) in reducing the market clearing price (MCP) at WESM. MOE can also be realized via more and cheaper conventional plants like coal rather than expensive and intermittent REs. With conventional plants, there is no need for additional ancillary costs. So, since PEMC continues to be a government controlled corporation, can we expect PEMC to be more independent, more candid, in assessing the harm, actual and potential, of more REs in WESM and grid stability? The most logical answer is no. The DoE cannot contradict itself, say that REs are necessary and say at the same time that REs are dangerous to the customers’ pockets and the stability of the national grid. So the important implication here is that the independent market operator (IMO) as clearly stated in the EPIRA (Electric Power Industry Reform Act) some 15 years ago and now represented by PEMC, should be independent from government like AEMO. The DoE secretary and all other government energy agencies, including those in the “advisory” capacities, should get out of IMO or PEMC board. Having less government intervention in the energy sector in general and the electricity market operation in particular is pro-consumer. Just give the consumers more choices, no or little coercion and they will choose the least costly, the more stable and reliable energy source. Mr. Oplas has written about the PEMC, renewable energy, and related issues in his previous columns. To read his pieces entitled “State dependence of Philippine electricity market” and “Renewable energy, expensive electricity, and the merit order effect,” please visit these links http://goo.gl/r0XaLt, http://goo.gl/Hf6DRg, respectively. Remember Isaac Newton's 3rd law of motion: For every action, there is an equal, opposite reaction. Apply in society: For every government intervention and prohibition, there is an equal opposite distortion. This news was reported last August 13, 2016. If government implements this, there will be MORE traffic congestion, not less, on Edsa and rest of M. Manila. Why? Because many of those probinsyanos/syanas who ride the provincial buses are car owners. They leave their cars in Pampanga, Tarlac, Bulacan, Pangasinan, Cavite, Batangas, Laguna, etc. when they go to Manila because it is more convenient, more time-saving to ride the buses. Now remove the provincial buses in Edsa, transpo going to Manila will be more inconvenient, take multiple rides, more time consuming, more costly. Solution: drive their cars or motorcycles from the province. About three years ago, MMDA's former Chairman Francis Tolentino banned buses from Cavite, other parts of Batangas to enter Lawton and Buendia, they unloaded passengers only in Uniwide warehouse at the coastal road. Huge headache for many passengers on the first few days, they have to take a M.Manila bus -- less convenient, less modern, aircon not so cold, etc -- or jeepney, non-aircon. I noticed that the week after that, traffic worsened in Edsa, elsewhere. Precisely because many of those probinsyanos are car owners. With the inconvenience and higher cost of multiple rides, many of them drove their cars to Manila. 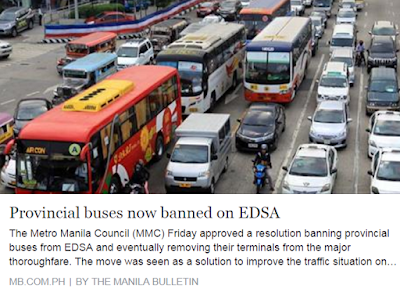 And after banning provincial buses in Edsa and traffic congestion remains bad if not worsened, what's next? Banning private cars 2x or 3x a week. And many middle class and rich families will buy more cars that they can use on days where their other car/s are banned. Many probinsyanos carry heavy loads when they go to Manila. Whenever I visit the farm in Pangasinan, the lightest load I carry back home is 15 kilos. Rice, buko, bananas, jackfruit, etc. Taking a taxi from Cubao alone to Makati would cost me nearly P300, which is equivalent to my aircon bus fare from Pangasinan to Cubao. So I take the city bus, Cubao to Makati, cheap, only P26, but travel time is long. Between 1 to 2 hours, depending on time of arrival in Cubao. So if government will make the provincial buses to stop only at Novaliches or even Valenzuela, then my taxi fare will be much higher and if I take the Manila bus, my city travel will become 2 - 3 1/2 hours. Better drive my car and carry up to 50 kilos, 100 kilos or more of provincial goods. But then I will be adding to more traffic in Manila. And then many people will say we should ban more cars. sus ginoo. 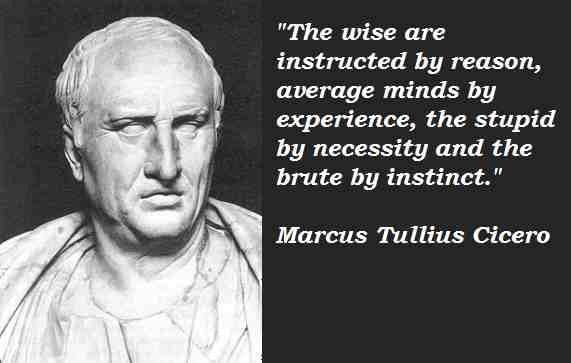 A friend Reuel H wrote, "I can attest to that. One of our bosses lives in Apalit, Pampanga and takes the bus to work. He would leave his car at SM San Fernando and board the Genesis Liner coming from Bataan to conveniently drop him off at EDSA-Shaw Crossing. With this ban, he may be forced to bring his car all the way to Ortigas Center, thus contributing to the already-horrible gridlock in this business district." Government should be banned from their frequent ban-prohibit mentality and policy. Very unimaginative and dictatorial. Heavy rains and flash flood are natural and cyclical, nature-made and not "man-made". Big El Nino and drought is often followed by big La Nina and frequent/heavy rains. To help prevent or minimize flash flood, build more dams and "harvest" the water, instead of cursing the flood. After the wet months, or during El Nino years, we will thank the floods that deposited water in the dams. The problem here is that people and officials think there is only global warming and no global cooling. That there is only "man-made" CC and no "nature-made" CC. That less flood or no flood or more flood are all proof of "man-made" CC so more money should be sent to the UN, CCC, DENR, LGUs, other government bureaucracies and they will "fight" less flood and no flood and more flood. Instead of using that money to (a) build more dams in rivers upstream, (b) do large-scale dredging of silted rivers and lakes, or (c) build artificial lakes in low-lying areas as temporary dumping ground of heavy flash flood. For the "man-made" warming/CC religion, these non-stop rains and flooding elsewhere were caused by our modern life, by our cars, air-cons, energy-intensive industries and condos and malls and airplanes and buses. http://interaksyon.com/.../habagat-to-dump-rains-on-luzon... Thus, we should have less fossil fuels, less or no coal power plants. 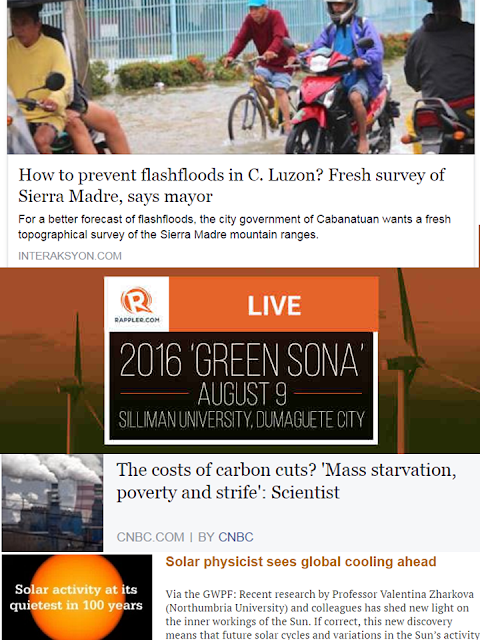 Modern life via reliable and cheaper electricity from coal is wrong, that is the message of CCC and Manny de Guzman, Lucille Sering, Yeb Sano, Tony la Vina, Sens. Legarda and Zubiri, etc. BWorld 78, If the US becomes protectionist, who loses? 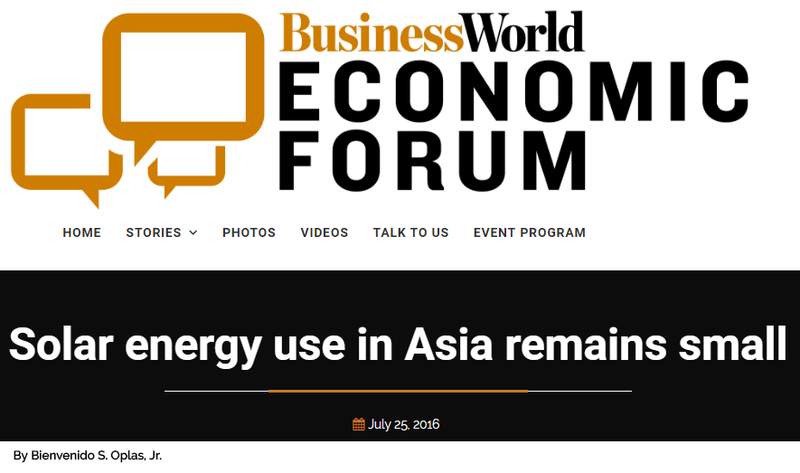 * This is my article in BusinessWorld last August 03, 2016. The purpose of free trade is to make cheap things remain cheap and the purpose of protectionism is to make cheap things become expensive. Protectionism imposes high tariff, taxes, fees, charges, and more paper work to complicate things that are otherwise simple and easy to do. As the US presidential election nears, many issues have become convoluted as expected in any major political exercise. One issue that gets murky is trade. Mr. Donald Trump has been vocal about some of his protectionist pronouncements like attacking the US involvement in the Trans-Pacific Partnership (TPP) while Mrs. Clinton is less gung-ho about protectionism. Last July 26, 2015, Bloomberg produced an article, “If Trump Wins, Asia Loses.” This story was shared by many Filipinos in Facebook and other social media platforms because the Philippines was mentioned. The Philippines faces risks because of possible immigration restrictions. The US is host to 35 percent of the total number of Filipinos working abroad, and Nomura estimates they account for about 31% of total worker remittances, a key source of foreign inflows for the local economy. There are a number of misinformation stated in this report. One, in trade theory and practice, the big loser in protectionism policy is the protectionist country, not its trade partner/s. Two, the US’ merchandise trade exposure in Asia is huge, indicating that US households and businesses make substantial income and savings when they export to and import from Asia than Europe or Central and South America. In 2014, 27% or more than one-fourth of its exports went to Asia, its second biggest continental trade partner next to its North American neighbors, and bigger than Europe. And almost 40% of its imports that year came from Asia or slightly lower than its imports from North America and Europe combined at 46.5%. Three, while the Philippines exported $8.4 billion to the US in 2014, it also imported $10.1 billion from the US, so it makes little sense to antagonize the Philippines with protectionism when the US earns more from the partnership. The US BPOs here means those US companies provide good services and backup support to their customers worldwide by utilizing cheaper and efficient personnel in the Philippines. 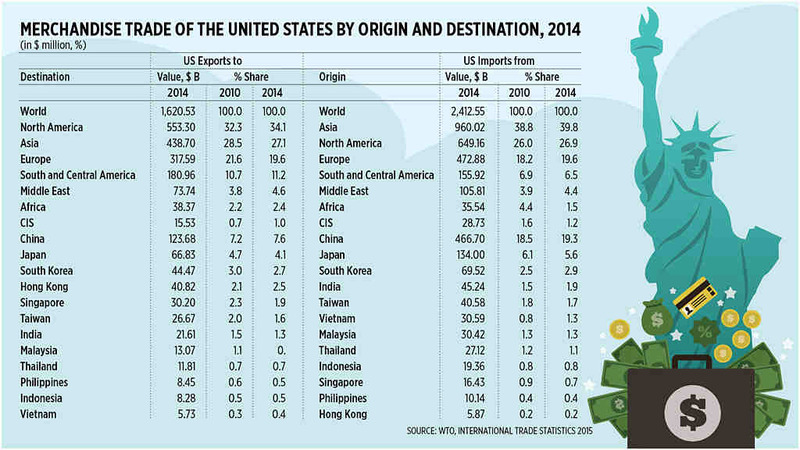 The table shows merchandise trade of the United States by origin and destination, 2014, $ million and percentage. Four, a graphical presentation that the bigger loser of protectionism policy is the protectionist country, not the trade partner/s would look like this: Imagine a supply-demand curve with equilibrium or market-clearing price of P* for all trading countries. Country A becomes protectionist, its supply curve moves to the left so its new equilibrium price goes up to P1, higher than P*, or P1 > P*. In contrast, countries B, C,... remain free traders, their respective supply curves move to the right, their new equilibrium price moves lower to P2, or P2 < P*. Consumers and manufacturers in these countries will be happy with more supply of various products and result in lower prices owing to trade diversion from protectionist to other free trader economic partners. There will be some short-term business dislocation, true, but firms and people adjust or even anticipate these changes and have plans B and C in place, including bigger trade among non-protectionist economies. If America -- whether under Mr. Trump or Mrs. Clinton -- will become protectionist, America loses, not Asia. Free trade, more choices, more economic freedom, is the best policy that a government can give to its people. Bienvenido S. Oplas, Jr. is a SEANET Fellow, head of Minimal Government Thinkers, and both institutes are members of the Economic Freedom Network (EFN) Asia. Words of wisdom from a Roman philosopher, Cicero (106 - 43 BC) nearly 2,100 years ago. There are minor differences in these two quotes, should be a result of different translations. A consequence of always on budget deficit, always borrowing, is high interest payment alone. Sige, utang lang ng utang ah. The "freedom from debt" campaigners but have little or no "freedom from (endless) borrowings" philosophy are concerned too about the P6.4 trillion (as of around end-2015) PH public debt. Living beyond our means is justified in period of fiscal/economic crisis, natural disasters like huge earthquakes, landslides, volcanic eruption, etc. Governments must borrow to replace damaged roads, bridges, etc. In period of no crisis, no disasters, we should live BELOW our means, have surplus and pay back old loans, and build up savings and reserves for future emergencies. Anywhere in the world today, very few countries and governments do this. Majority are on the spend-spend-spend, borrow-borrow-borrow, tax-tax-tax policies. 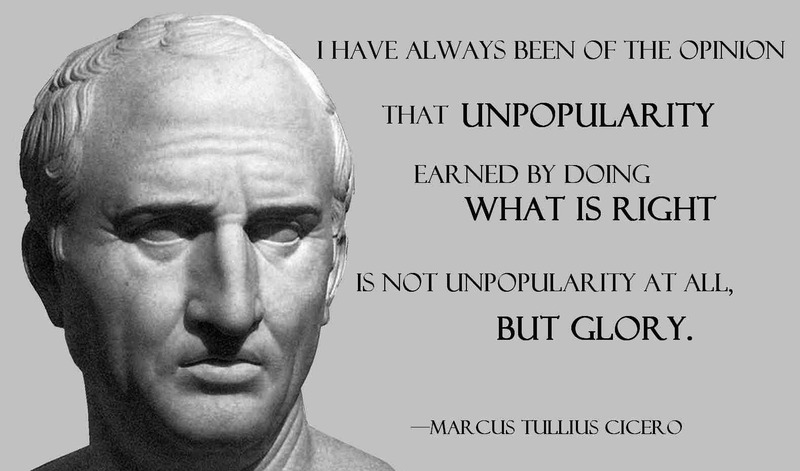 And that is how almost all governments in the planet are heavily indebted. With public debts of 40%, 100%, 200% of GDP. Too many politicians, NGOs, consultants, academics, etc. are corrupted by foreign aid -- from the UN, WB, ADB, IMF, USAID, etc. There is endless drama on poverty and inequality so that there will be endless flow of foreign aid. When poverty was defined as "earning only $1/person/day" many years ago, poverty rate then was high. After 1-2 decades of growth in many countries, hundreds of millions were lifted from poverty, and there was corresponding adjustment to $1.5 or $2/day/person, and so poverty remains high again. When poor people move up the income ladder and are no longer poor based on that definition, foreign aid officials and consultants will likely revise the definition of poverty as earning $3/day/person and conclude that poverty remains high and horrible, and so horrible amount of foreign aid and tax money from rich countries should be needed. "I am not sure about the outcome of these policy recommendations we made. But one thing I am sure of is that before this project, I was somehow poor. After this project, I am no longer poor." And the USAID people were laughing; funny but true. 1. 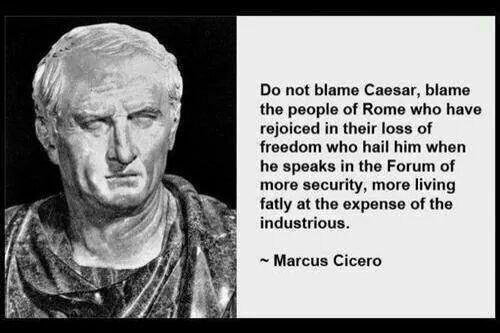 Laws are silent in time of war... No one has the right to be sorry for himself for a misfortune that strikes everyone. 2. Freedom is a man's natural power of doing what he pleases, so far as he is not prevented by force or law. 3. What gift has providence bestowed on man that is so dear to him as his children? * This is my article in BusinessWorld last July 26, 2016. Migration means mobility and freedom. The free movement of people along with their skills and talent, families and colleagues, culture and sports, science and technology, capital and investments, is the natural sibling of free trade of goods and commodities. The world is far from real free trade in goods and free mobility of people, but the regional and global trend is towards more freedom, not less. The numbers to confirm this are freely available -- rising exports and imports, rising foreign investments, rising tourism. 1. While there are more than 10 million Filipinos living and working abroad (workers and professionals, students, dependents), there are only 0.2 million foreigners who have migrated here, more or less permanently. The number of overseas Filipino workers (OFWs) based on Philippine Statistics Authority (PSA) is only 2.3 million, not 10 million, as explained in the table. 2. 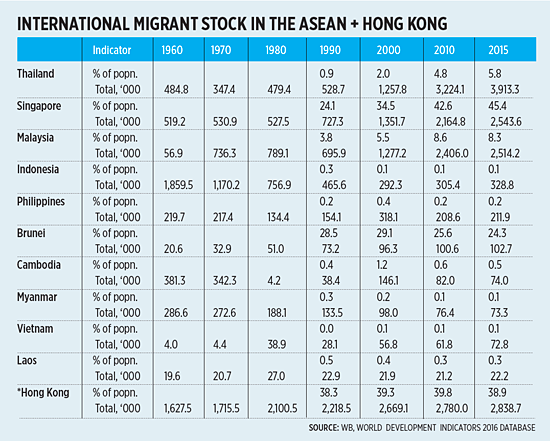 Thailand, Singapore, and Malaysia are the most migrants-friendly in the ASEAN. Perhaps they allow foreigners to own residential lands. These countries are also the top international tourism destinations in the region. 3. Laos, Myanmar and Vietnam are the least friendly to foreign migrants. While the first two are weak in exports and attracting foreign investments, Vietnam’s case is weird because it is a big exporter, its annual merchandise exports is twice that of the Philippines, yet just a few foreign migrants relocate there permanently. 4. Indonesia has a different path in migration. Nearly two million in 1960, down to more than one million in 1970, and only 0.3 million in 2015. Meanwhile, the number of Indonesians working and living abroad is rising, similar to the Philippine case. While short-staying foreign tourists and visitors would stay in hotels, migrants would stay in apartments and condos. They contribute to rising demand for housing. Filipinos who work and live abroad do not necessarily abandon or sell their houses and condos here, they keep these to stay when they come home, or allow relatives and close friends to use them. The housing shortage is a big problem for the Philippines and other developing countries. Data for Hong Kong is added in the table. Its 7.5 million local population + 2.8 million migrants + around 1-2 million tourists anytime (27.8 million tourist arrivals in 2014) is big considering its small land area. Yet housing is not much a problem there. A quick solution to address the huge housing backlog in the Philippines is to encourage the building of more residential condos and townhouses not so much for ownership but for rental. There are at least two advantages for this. One, more and more Filipinos are mobile these days. They may be working in Quezon City or Bulacan the previous years, they might move to Las Piñas or Cavite or Cebu in the next few years, or move abroad. Given the bad traffic condition in Metro Manila, living closer to work is a better alternative than driving long distance daily. Two, there is less initial investments in renting than in buying a house. There is also less financial and emotional attachment to their previous house when they move out if the community has deteriorated, like getting flooded more frequently, more traffic congestion, more crime incidence, and so on. What HUDCC and other housing-related agencies, local and national can do, is to reduce the bureaucracies and taxes for developers of condos and townhouses. These costs are ultimately passed on to unit owners, which they pass on to their unit lessors. If there are more residential condos and apartments available, their price will naturally go down due to competition. Cheaper housing is one of the most important programs that any government can do for its people. Bienvenido Oplas, Jr. is the head of Minimal Government Thinkers and a SEANET Fellow. A friend in fb, Jasmin Romero of ABS-CBN posted the other day this report. ''I do not care. 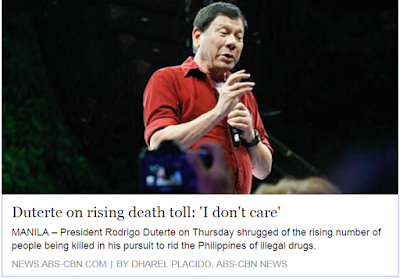 I really don’t care because I know na kapag iyang bangag na -- a user is always a pusher except you are the son of an Ayala or Gokongwei”' Duterte said…. Data gathered by the ABS-CBN Investigative and Research Group show that there have been 834 drug-related fatalities from May 10 to August 4. I commented there, "gago na sagot ito from a President." Note this, "gago na sagot" and not "gago na President". There is a difference between the two. The former is shooting the message/comment, the latter is shooting the messenger/person. 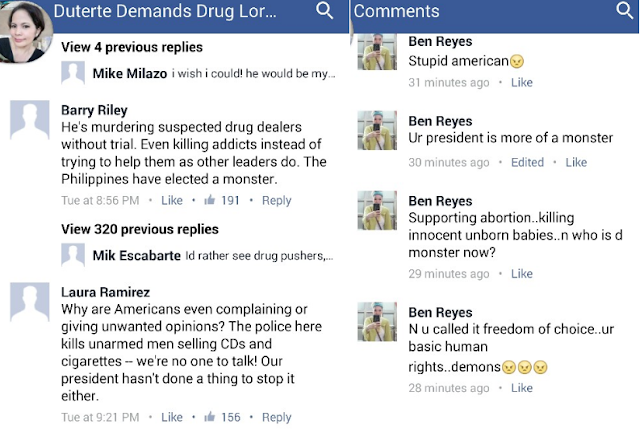 Then a low-life comment came from nowhere, from a certain "Ben Reyes". An emotional, angstful, defensive and low-life outburst rushing personal attacks on people who disagree with his/her idol. As I posted in the past, I was not a supporter of Mr. Duterte during the campaign period. But when he won and laid down his economic programs, I became his supporter. Yes, I support many of his plans and programs on the economy, taxation, investment liberalization, infrastructure modernization, etc. But NOT his policy on extra-judicial killings (EJKs) where deaths by the hundreds are justified. 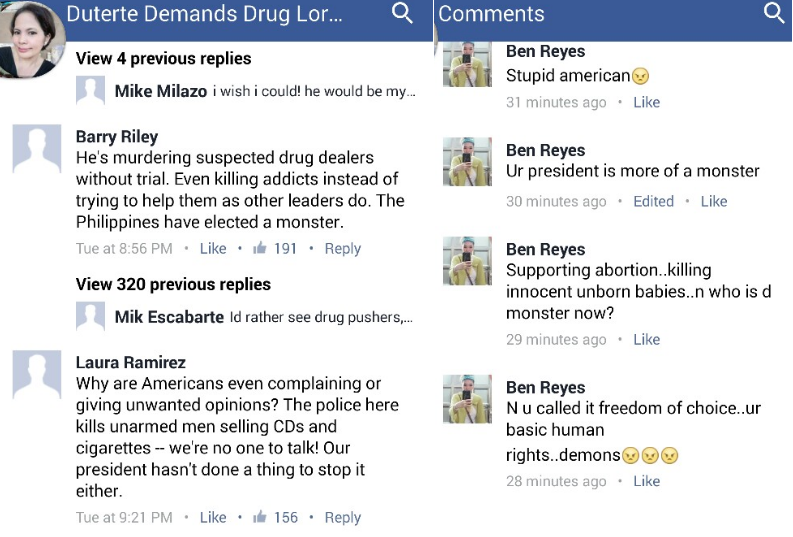 This Ben Reyes also posted these photos, again showing deep intolerance and angst at people who do not say Halleluiah to the EJKs of the President. A murder culture has permeated many minds in the Philippines, from the President down to ordinary voters. This culture is characterized by intolerance, deep intolerance and impatience of contrary opinions. And here is another low-life comment. Killing me or anyone else is now just an ordinary joke for these lousy minds. Low life. If we are to modernize as a country in the 21st century, we need a culture of tolerance to contrary opinions, a respect for the rule of law, not rule of men and mob rule. No one among the people that I know who oppose EJKs justify drug pushing and drug addiction. I myself have no sympathy to this kind of personal abuse and criminal act of drug pushing. But I cannot justify or support EJKs and murder without trials. * This is my 3rd article in the special issue, BusinessWorld Anniversary Report last July 25, 2016. Due to limited space, the table was not shown but the arguments and texts are retained. The rapid pace of economic growth in East Asia over the past two to three decades coincided with, or was facilitated by, high energy capacity largely coming from coal power plants. This is shown by the numbers below covering two decades. Electricity generation and solar power consumption are expressed in terawatt hours (TWh, 1 TW = 1 million MW), coal consumption is expressed in million tons oil equivalent (mtoe), and GDP size is valued at Purchasing Power Parity (PPP). 1. The Philippines has a small electricity production, only 83 TWh in 2015 or just one-half (1/2) that of Vietnam and Thailand and only one-third (1/3) that of Indonesia. This is a reflection of its low installed power capacity relative to its neighbors. 2. China and Vietnam have significantly expanded their electricity production in the last two decades by nearly 500% and 1,000%, respectively. This coincided with, or significantly contributed to, their high GDP expansion of 769% and 426% respectively for the same period. China has a very high level of coal use, 1,920 mtoe in 2015 while Vietnam has a very high % expansion of coal use, 616% in just two decades. 3. Of the 12 Asian economies listed, only three — Japan, Thailand and Hong Kong — did not experience 200+% expansion or quadrupling of GDP size after two decades. They are also the three economies plus Pakistan, that did not experience high expansion in electricity generation and coal use. 4. 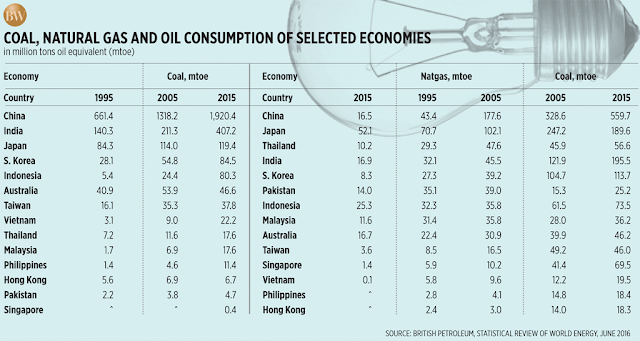 The eight other Asian economies have benefited from higher electricity generation, higher coal use, and coincided with or facilitated higher GDP size expansion in just two decades. 5. Solar power consumption in Asia remains very small. Less than 0.05 TWh in 2015 for six of the 12 economies — Vietnam, Hong Kong, Malaysia, Philippines, Singapore and Thailand. Thus, statements that many Asian economies have (a) significantly embraced new renewables like solar, and (b) their use of coal power is declining as they shift towards more solar and wind power – are preposterous. 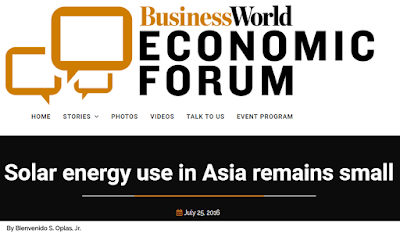 During the BusinessWorld Economic Forum last July 12, 2016, the subject of Philippines’ power and energy policies was mentioned several times by different speakers. In his keynote speech, First Pacific Co. Ltd. managing director, said that “The recent heightened interest in renewables is understandable. But let me say this: for now, renewables cost more than conventional power, which means higher power prices. There’s a cost to protecting our environment — no such thing as free lunch.” He added that we are heading towards sufficient power capacity and majority of these power plants are coal. DoF Secretary Carlos Dominguez III partly mentioned the importance of a realistic energy mix that will not burden the consumers with high electricity prices. In the panel on Disruption, Solar Philippines’ President Leandro Leviste argued that “solar is now cheaper than coal.” He added that batteries to stabilize solar output that currently costs an additional P2.50 per kWh to solar power can significantly drop by one-half by 2020. Still, he argued, that solar + battery prices, solar can replace all gas, oil, and diesel in the Philippines. In the panel on Infrastructure Capacity, Eric Francia, President & CEO of Ayala Corporation Energy Holdings, Inc. showed one slide where the Philippines’ power capacity 2014 was only 15.6 GW vs. Vietnam’s 40+ GW. Finally, in the same panel on Capacity, Erramon Aboitiz, President & CEO of Aboitiz Equity Ventures, Inc. (AEVI) said that the Electric Power Industry Reform Act of 2001 (EPIRA, RA 9136) is working. It stopped the financial drain of government with heavy NPC monopoly losses and debts, attracted investments from the private sector and competition has driven down power rates. He rightfully argued that in deciding the energy mix, affordability to consumers and stability of power supply should be a priority for the government. The open access and retail competition provision give customers the power of choice. There are several ways that expensive solar energy will burden the consumers in the coming years. One, the high feed in tariff (FiT) of P8.69/kWh in 2015, that becomes P9.69/kWh in 2016, that will become roughly P10.70 by 2017, and further rise in 2018 and beyond as indexation to inflation rate and other factors are inserted. Two, this ever-rising solar price is assured for 20 years for each FiT-eligible solar company. Three, even consumers in Mindanao who are not connected to the Visayas-Luzon grids and not part of WESM energy trading are forced to pay this expensive FiT. Four, the priority or mandatory dispatch into the grid even if cheaper sources like coal that can be sold at marginal price of only P1 to P1.50/kWh during off-peak demand hours and days are available. And five, the impending renewable portfolio standard (RPS) will force, coerce and arm-twist many or all the distribution utilities (DUs) in the country to buy a minimum percentage from expensive renewables, the additional cost will be passed on to the consumers. The government should step out of energy rationing and cronyism. Consumers should be given the freedom to choose, to buy from cheaper energy and avoid expensive electricity. Current legislation via the RE law of 2008 (RA 9513) that institutionalizes energy cronyism should be amended or abolished. This is one policy measure that President Duterte and DoE Secretary Cusi can consider in the next six years. Labels: renewable energy, solar energy. Four years ago, I wrote this paper in interaksyon and shared it in my fb wall with this note, "People are assets, not liabilities. Government should focus on promulgating the rule of law, not in expanding bureaucracies and in population control." I never supported that bill (now a law) of more government, state-sponsored population control. Condoms and pills lang, gobyerno pa. So my opposition to that measure was nowhere on the morality issues raised by the church. It's mainly an opposition to further government expansion. Things that can be done by civil society and volunteerism like donating pills and condoms, gobyerno pa? Gawad Kalinga, Rotary Homes, other NGOs are able to build thousands of houses for the poor via civil society, volunteerism route, NOT legislation and national coercion. 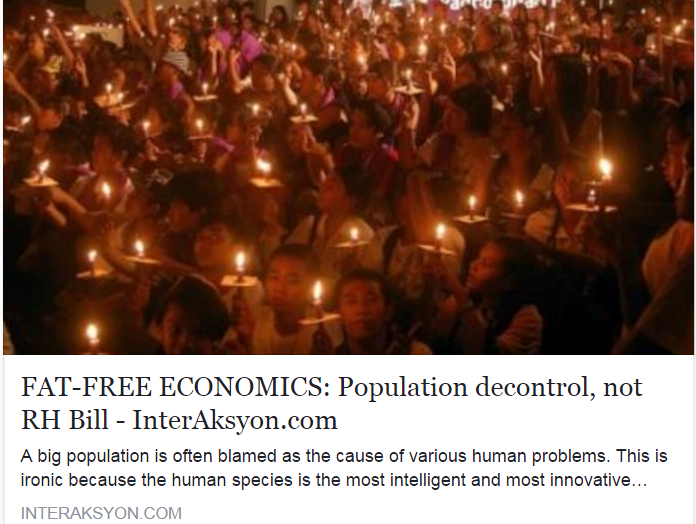 The pro-RH guys and campaigners then were gloating that because they could trump and debunk the church arguments, the more government, more state-sponsored population control argument was correct. So when I argued my position -- zero regard for church position, zero sympathy for "more government" -- many of them could not anticipate and rebut my position. But then again, it's all politics. The legislators, the DOH, PopCom, LGUs, etc. were just happy that government has further expanded. I hardly read the church position on the RH then because I felt I could not and would not use them. My argument has zero regard for church position, catholic or otherwise. Mainly about Big government vs. civil society volunteerism. Gawad Kalinga (GK) can build thousands of houses, more expensive than pills and condoms, via volunteerism. 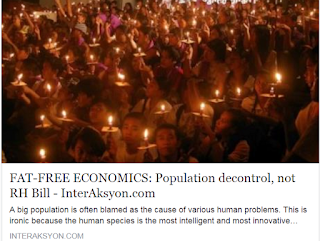 Why force the rest of the population to contribute to their "bright idea"? If an idea is bright, it does not need coercion, national coercion and arm-twisting to be implemented. GK, Rotary Homes, etc. are successful, even with zero legislation, zero national coercion. I have visited some rotary homes projects, dozens if not hundreds in one RI District alone here. Money usually comes from abroad, rich Rotarians from rich countries, plus rich local Rotarians. Those rich Rotarians from abroad would give money for housing for the poor here, to their fellow civil society leaders like local Rotarians. But NOT to the government when it builds housing for the poor. That is why a bright idea very often does NOT need legislation and national coercion. If done via legislation, 90-99% it is a stupid idea. My Filipino friend in the US regularly donates to GK, yearly. He is updated by GK and so far, he is happy with the projects. He says that if he can confirm just one instance, not 2 or 3 but just one instance of corruption and stealing of his donation, he will automatically stop donating. See the system of reward and punishment via civil society? It is instant. The same in rotary. One instance of corruption, of stealing donated money, those rotarians, their clubs, are blacklisted and implicitly shamed. Within months, not years. Goodbye to professional and business network, replaced by shame. The pro-RH camp then keep repeating the argument that there is no force, no coercion, "walang pilitan" employed and stated in the law. Walang pilitan sa RH? Eh ayoko magbigay more tax money to the government for state-administered condoms and pills distribution, may choice ba ako? saan? where? Kaya nga legislation kasi pilitan eh. 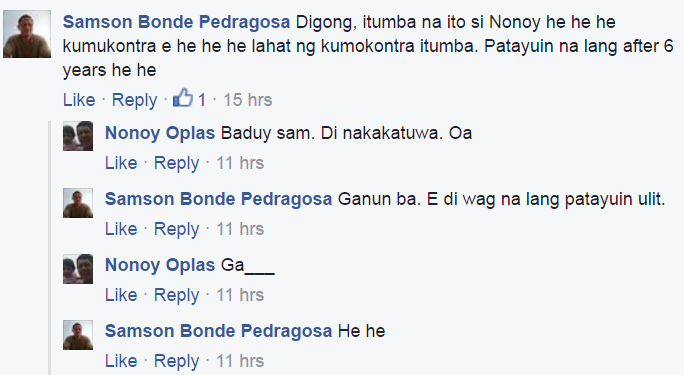 Sa ayaw at sa gusto mo, sumunod ka, bayad ka. The activists are the usual government-bashers. They distrust government, which is understandable. They distrust government's implementation of education for the poor, housing for the poor, tractors for the poor, rice subsidy for the poor, MRT subsidy for the poor, etc. Fine. But why do ask for more government, like the state-administered condoms for the poor, suddenly they trust government. Neh? 1. Government will put up a jeepney and bus corporations, subsidized and funded by taxpayers of course. People can take them or not, no coercion/walang pilitan naman eh. Sila taxpayers lang ang obligado magsubsidize kasi palaging lugi. 2. Government will put up a new state university in all provincial capitals on top of existing ones. Students can enroll there or not, walang pilitan naman eh. sila taxpayers lang ang obligado magbayad. 3. Government will put up a "carinderia ng bayan" in all 42k+ barangays and villages nationwide. People can eat there or not, walang pilitan naman eh. sila taxpayers lang obligado magbayad sa subsidy. Magaleeeng. From the DOE website, some group photos showing some of the major players in the PH energy sector. 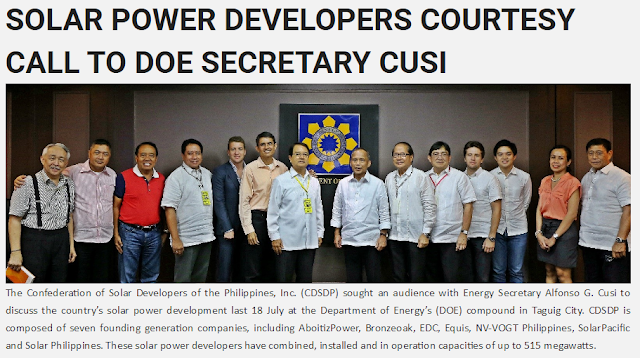 Below, one solar group, the Confederation of Solar Developers of the PH, Inc. (CSDP). From left: DOE Chief-of-Staff Jesus Cristino Posadas, Engr. Arwin Ardon, Ret. Admiral Reuben Lista, Central Tarlac Biopower Inc. President Don Mario Dia, Equis Manager Craig Marsh, NV-VOGT Phils. President Vivek Chaudhri, North Negros BioPower, Inc. President Arthur N. Aguilar, Reynaldo Casas CSDP President, Aboitiz Equity Ventures Inc. Senior Vice President Juan Antonio Bernad, Carlos Aboitiz of Aboitiz Power, Solar Philippines President Leandro Leviste , SolarPacific Energy Corp. Senior Business Development Officer Dyna Enad, DOE Spokesperson & NASECORE President Pete Ilagan. Cusi asked both agencies to “go down to the cooperatives” to resolve the issues raised by electric cooperatives namely PHILRECA, QUEZELCO and AMRECO, among others. Among the issues raised by the electric cooperatives were ensuring the right of way for electric projects, tax reforms, non-privatization of Agus and Pulangui complexes in Mindanao, the interconnection of SPUG areas to the main grid and the putting up of a one-stop shop and fast lane for the processing of permits and licenses for energy projects. On the DOE-Meralco partnership in providing electricity connection to relocated informal settlers. When "free electricity connection" was reported in local media, I asked Joe Zaldariaga what it means -- only the one-time cost of electricity connection plus meter readers are free, or also the monthly electricity bill of the informal settlers. Joe said that only the former is free. The latter, people still have to pay their monthly electricity bill. This is low anyway because of the "lifeline subsidy" for consumers of only 100 kWh a month or less. 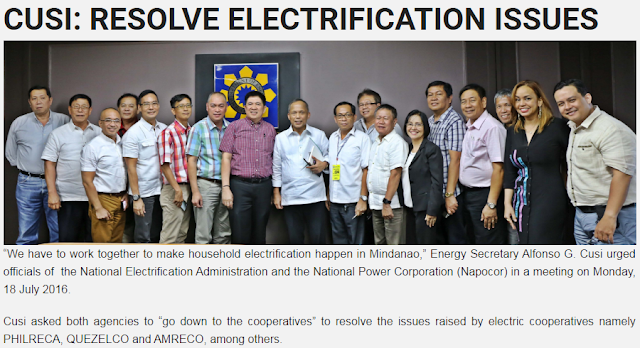 Meanwhile, I am curious why the electric coops would oppose the privatization of hydro power plants in Mindanao? This is long overdue as EPIRA was enacted in 2001 or 15 years ago. Besides, only private players operating in a competitive environment would have enough incentives to really improve the electricity output of those hydro plants, especially when WESM in Mindanao would start operating. 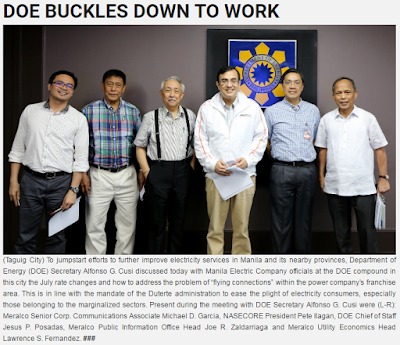 Labels: electric cooperatives, Meralco, solar energy.